We all know Google is a good company that creates many useful, nice internet services, but something we still do not like, like internet privacy, Google always spies us while we are using its service, especially search engine. If you are really concern your online privacy you should use third application to stop Google tracks you. Google Sharing is a new web service that offers a Firefox plug-in. It automatic chooses a proxy service while you use Google search engine, so Google does not know your real IP address where from. It is very easy to do, just download Firefox plug-in, restart Firefox. By default setting, Google Sharing is enabled with Google search. Now, you can search data with Google search. But, Google Sharing only works with Google search, it is not to Google personal services, like Chat, GMail, Checkout, Sites, Docs, Photos, Calendar, Reader, Health. 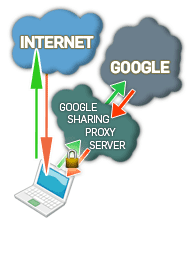 Google Sharing also offer an application that allows users to run own proxy service. If you have a web server you can download a file, and install it on your web server.